Does diving sound like a bit too much adventure? It's not... as long as you love swimming. If you enjoy a relaxing beach vacation, you should consider adding a few days under the water. If you love snorkeling, really consider learning SCUBA. Time underwater at a beautiful resort is a relaxing trip as far as we're concerned. I had always wanted to try SCUBA. Mark was not so enthusiastic; he's a little more wary in the water. A good travel buddy had been trying to convince us to get certified. My sister had been trying to convince us to get certified. Then our buddy got married, and Gladys came to the wedding... and we just happened to be seated next to Gladys. 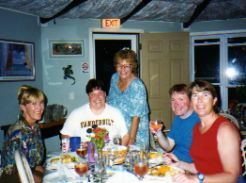 Gladys was the owner and the wonderful spirit and driving force behind Pirates' Point Resort on Little Cayman Island. Gladys was also very persuasive. We went to the Florida Keys to get certified. Our PADI course was four days. The warm, clear waters appealed to us more than the cold waters we have in California. You can always take the course and pool work at home, then arrange to do your open water dives at a resort that offers that cooperation. Mark was leery of breathing underwater and all that equipment, but now that he's tried SCUBA, he says he'd much rather have that regulator in his mouth than just a snorkel. We went on our first trip to Pirates' Point Resort with everyone who had been trying to convince us to get certified. It was magic. And very relaxing... no phones, no TVs, no crowds... and Gladys and her staff made you feel like you were visiting old friends. Sad to say, Gladys is gone now, but her family still runs Pirates' Point, and it still gets rave reviews. After a leisurely breakfast, guests and gear are trucked to the Yellow Rose at about 10. You can stay down as long as you have air if you work with dive computers. No rush or pressure. Until cocktail hour and dinner. And let me just tell you, the staff keeps everyone happy with their gourmet meals. Bloody Bay Wall is a world renowned site, and the wonderful dive masters make it all so easy. You take the Yellow Rose out to the reef and fall into the clear warm water. Gaye and the rest of the crew can show you the hidden gems of the wall or give you directions to swim off on your own. 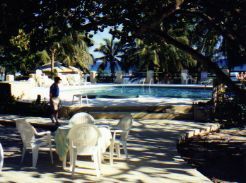 They took such good care of us, that Mark wouldn't consider trying to dive anywhere else for several years. 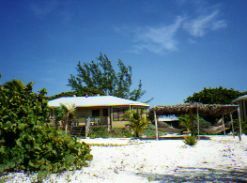 If you think you'd like to visit Pirates' Point, check out their website. Tell them that Mark and Judy sent you. You can see below that Mark thinks it's OK.
We do carry our certification cards with us when we travel... even if that isn't the focus of the trip. 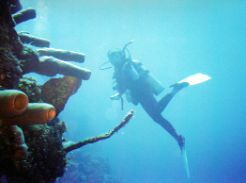 A recent trip to Belize included a day of SCUBA. 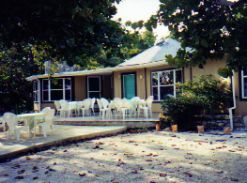 The reef is beautiful, and the staff was helpful and friendly. 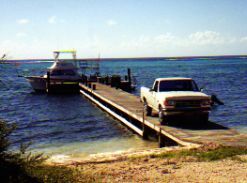 The resort routine was just as relaxing as it was in Little Cayman. 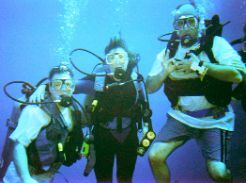 We also dove in the Red Sea when we visited Jordan. I don’t know about diving there, but My Island Jamaica can tell you about the beaches, food and reggae all from a local. We're a little too active to just go someplace and sit on the beach, so a SCUBA vacation gives us the sense of adventure we love, but lets us slow down and relax too. The best of both worlds. So if you're trying to come up with a custom tour or just a vacation that is a little different than simply finding a beach... think about taking a SCUBA course and spending a little time exploring a whole new world.